Born in Ravensburg, in 1129 or 1131, he was the son of Henry the Proud, Duke of Bavaria and Saxony, who was the son of Duke Henry the Black and an heir of the Billungs, former dukes of Saxony. Henry's mother was Gertrude, only daughter of Emperor Lothair III and his wife Richenza of Northeim, heiress of the Saxon territories of Northeim and the properties of the Brunones, counts of Brunswick. Henry is the founder of Munich (1157; München) and Lübeck (1159); he also founded and developed numerous other cities in Northern Germany and Bavaria, a.o. Augsburg, Hildesheim, Stade, Kassel, Güstrow, Lüneburg, Salzwedel, Schwerin and Brunswick. In Brunswick, his capital, he had a bronze lion, his heraldic animal, erected in the yard of his castle Dankwarderode in 1166 — the first bronze statue north of the Alps. Later, he had Brunswick Cathedral built close to the statue. In 1147, Henry married Clementia of Zähringen, thereby gaining her hereditary territories in Swabia. He divorced her in 1162, apparently under pressure from Emperor Frederick Barbarossa, who did not cherish Guelphish possessions in his home area and offered Henry several fortresses in Saxony in exchange. In 1165, Henry married Matilda (1156–1189), the daughter of King Henry II of England and Duchess Eleanor of Aquitaine and sister of King Richard I of England. Henry faithfully supported his older cousin, Emperor Frederick I (Barbarossa), in his attempts to solidify his hold on the Imperial Crown and his repeated wars with the cities of Lombardy and the Popes, several times turning the tide of battle in Frederick's favor with his Saxon knights. During Frederick's first invasion of northern Italy, Henry took part, among the others, in the victorious sieges of Crema and Milan. In 1172, Henry had taken a pilgrimage to Jerusalem(June–July), meeting with the Knights Templar and Knights Hospitaller, spending Easter of that year in Constantinople. By December 1172, he was back in Bavaria and in 1174, he refused to aid Frederick in a renewed invasion of Lombardy because he was preoccupied with securing his own borders in the East. He did not consider these Italian adventures worth the effort, unless Barbarossa presented Henry with the Saxon imperial city Goslar: a request Barbarossa refused. Barbarossa's expedition into Lombardy ultimately ended in failure. He bitterly resented Henry for failing to support him. 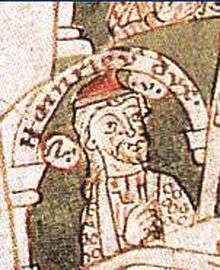 Taking advantage of the hostility of other German princes to Henry, who had successfully established a powerful and contiguous state comprising Saxony, Bavaria and substantial territories in the north and east of Germany, Frederick had Henry tried in absentia for insubordination by a court of bishops and princes in 1180. 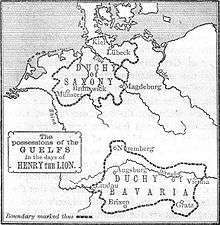 Declaring that Imperial law overruled traditional German law, the court had Henry stripped of his lands and declared him an outlaw. Frederick then invaded Saxony with an Imperial army to bring his cousin to his knees. Henry's allies deserted him, and he finally had to submit in November 1181 at a Reichstag in Erfurt. He was exiled from Germany in 1182 for three years, stayed with his father-in-law, in Normandy before being allowed back into Germany in 1185. He was exiled again in 1188. His wife Matilda died in 1189. When Frederick Barbarossa went on the Crusade of 1189, Henry returned to Saxony, mobilized an army of his faithful, and conquered the rich city of Bardowick as punishment for her disloyalty. Only the churches were left standing. Barbarossa's son, Emperor Henry VI, again defeated the Duke, but in 1194, with his end approaching, he made his peace with the Emperor, and returned to his much diminished lands around Brunswick, where he finished his days as Duke of Braunschweig, peacefully sponsoring arts and architecture. Henry the Lion remains a popular figure to this day. During World War I a nail man depicting Henry the Lion, called Eiserner Heinrich, was used in Brunswick to raise funds for the German war effort. Henry the Lion on the coat of arms of Schwerin. Order of Henry the Lion, order of merit of the Duchy of Brunswick (awarded from 1834 to 1918). Henry the Lion's Fountain (1874), Brunswick. Eiserner Heinrich (1915), Braunschweigisches Landesmuseum, Brunswick. Henry the Lion Monument in front of the Dom. Schwerin. Henry the Lion appears in Age of Empires 2: The Age of Kings in the Barbarossa campaign. He appears in the second and fourth missions initially as an ally to Barbarossa, but betrays him both times, which is historically inaccurate. The first time, he was spared and allowed to serve Barbarossa again. The second time, he was exiled to Britain. It is revealed at the end that he was the narrator of the campaign. 1 2 3 4 5 6 7 8 9 10 11 12 Emmerson 2013, p. 320. ↑ The Teutonic Knights in the Crusader States, Indrikis Sterns, A History of the Crusades: The Impact of the Crusades on the Near East, Vol. V, ed.Norman P. Zacour and Harry W. Hazard, (University of Wisconsin Press, 1985), 319. 1 2 Peter Lock, The Routledge Companion to the Crusades, (Routledge, 2013), 151. 1 2 3 Helen Nicholson, Love, War, and the Grail, (Brill, 2001), 129. ↑ Matthias Heine. "Barbarossas Staatsfeind Nummer eins" (in German). Die Welt. Retrieved 9 May 2013. ↑ Heinrich der Löwe (in German). Retrieved 9 May 2013. ↑ About the Cathedral. Retrieved 9 May 2013. ↑ Brothers Grimm. "Heinrich der Löwe" [Henry the Lion - The Brothers' Grimm version]. Deutsche Sagen (in German). Projekt Gutenberg-DE. Retrieved 10 May 2013. ↑ Enrico Leone (Heinrich der Löwe). Retrieved 9 May 2013.